I do a lot of different arts. In particular, I can do more things with string than an entire boy scout troop combined. This is displayed nicely in a competition I entered last weekend. I belong to a historic recreation group, the Society for Creative Anachronism. At the anniversary celebration of the local group, they held a body of work competition. They want to see everything you do, your entire body of work. There's this nifty blog thing on this website that I've been meaning to use more, so why not post my body of work. I think I shall! Weaving is what I've focused on most lately. I don't keep most of what I do, so I wove up several bands over the last couple months just for the competition. This was all done on an inkle loom, a small loom designed to make narrow bits of fabric. The one on the right is my favorite. It reminds me of an old sofa. It's got personality. Onwards on the string path we have card weaving and kumihimo. 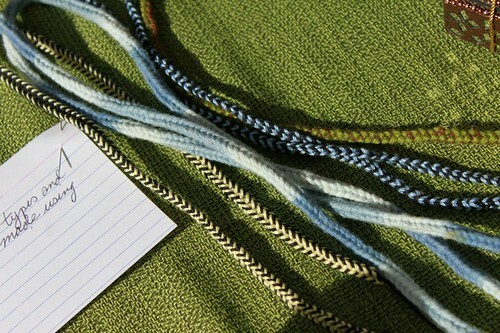 Card weaving has been around for centuries. The band on the left was done via card weaving. 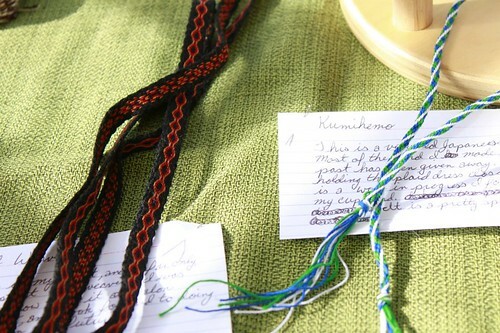 The bit of cord on the right is kumihimo. 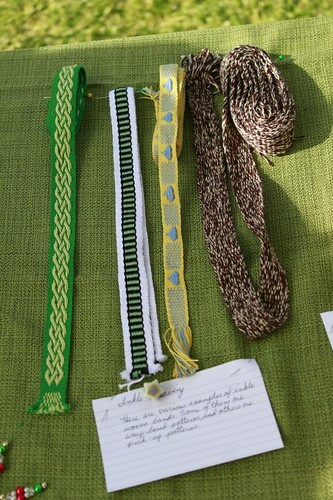 Kumihimo is a method of braiding string into cord. It's what samurai used to tie their armor. In the modern world, it's one way young girls make friendship bracelets. 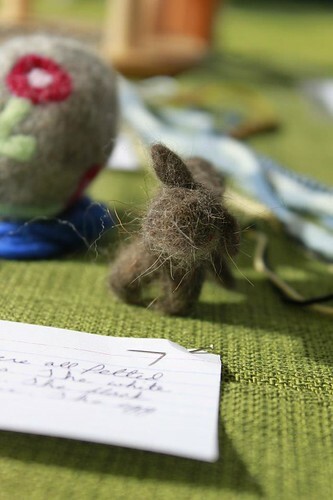 Embroidery! 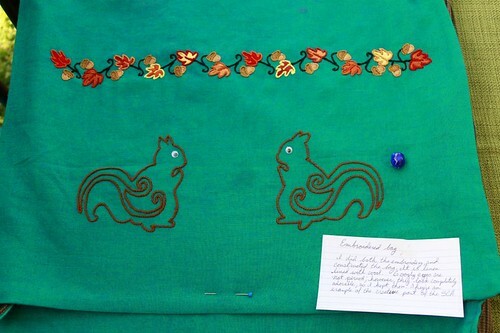 I love embroidery. I've been doing it since I was a small child. It's an art that I haven't done much of lately though. I fixed that problem for this contest though with this bag. It really is a bag I made, although these photographs just focus on the embroidery. I'm quite happy with how it turned out. 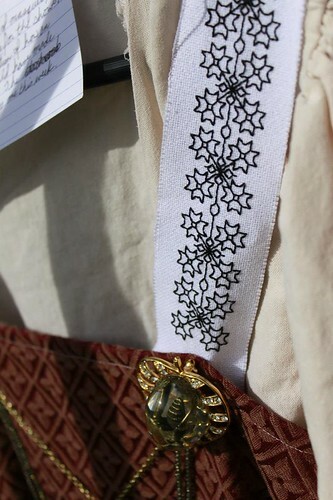 Another form of embroidery is blackwork. It was quite popular in Elizabethan times. The back of the piece looks exactly like the front when done properly. This piece was done as the straps for a costume I made, Elizabethan Viking. 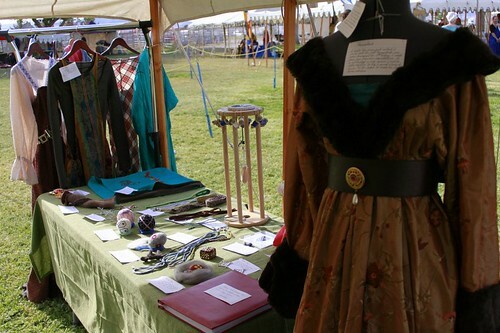 What would happen if someone from Elizabethan times made viking women's garb. The result is this. 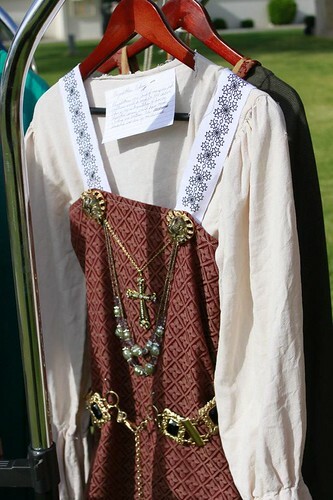 A viking apron dress, made with Elizabethan details. 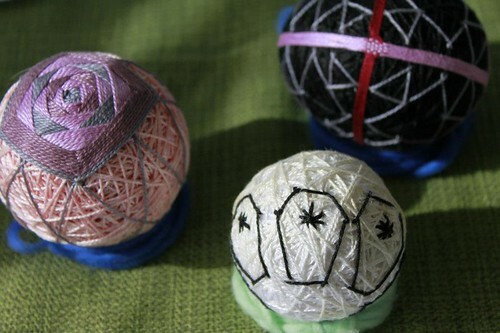 If you embroider a ball, you end up with Temari. It's an art that came to Japan via China about 700AD. They started as simple toys made from old kimono, and turned into elaborate works of art as ladies of court competed to see who could make the most intricately done temari. Protostring. String in process. The birth of string. 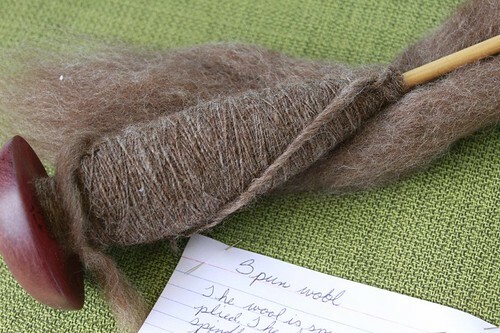 Alternately, if you don't want to make string, you can turn the fiber into other things via felting. 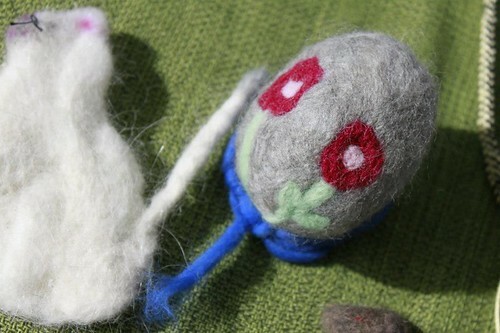 These little creatures were felted from various fibers. 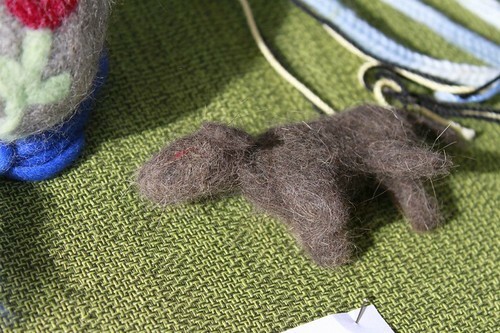 The dog was made from cat fur, the cat was made from dog fur, and the egg was made from sheep fur. This isn't all of the arts I do, these are just several of the ones I do with string. I'll make another post later with things that aren't string. My friends were heavily into the SCA when I was in college so I fought in the Estrella Wars a couple times.